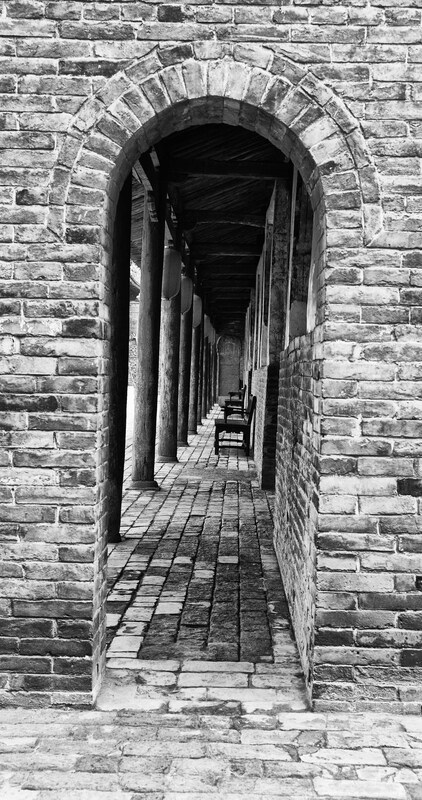 Looking through one of the many brick built arches which then lead you into beautiful courtyards where the owners of the day some 600 + years ago spent their leisure time enjoying the fruits of their labor. The scent of the flowers, Jasmine, Roses, Peonies and Chrysanthemum blooms and cherry blossoms in the spring. The peace and tranquility of the water as it meanders through the small pools filled with brightly colored gold fish and Koi carp splashing in the sun light like pieces of silver and gold…I can imagine these gardens filled with laughter, the sounds of opera singing and music by night and the quietness of meditation and the soundless exercise of Tai Chi Chuan as it is practiced during the rising hours of the morning. Love all the geometry in this photo.